Think of the most attractive “chocolate-box” thatched cottage that you can, and it still wouldn’t be a patch on this one! This was the family home of Shakespeare’s wife Anne Hathaway and he would have visited the cottage when he was ‘courting’ her. Shakespeare never actually lived here though as once they were married, they moved into Stratford to Shakespeare’s family home, now known as Shakespeare’s Birthplace. This building is extraordinarily beautiful and jam packed with lots of original features. It’s laid out as it would have been in Shakespeare’s time complete with beds upstairs and cooking implements downstairs. The cottage remained in the Hathaway family for several generations and was eventually bought by the Shakespeare Birthplace Trust in 1892. One of the most fascinating things inside the house is the Hathaway bed which dates back to Anne’s time and is well worth seeing. The straw mattress is held up by a network of ropes stretching from one side of the bed to the other. These ropes had to be tightened – hence the saying “night, night, sleep tight”. The other big attraction here is the cottage gardens which are superb. You won’t believe just how many plants have been crammed into the space available. On top of that you can spend time in the pretty orchard where there are picnic tables and a fairly new feature at the cottage is the woodland walk. This snakes it’s way through the woodland next door to the cottage orchard and there a seats along the way to rest. It’s longer then you think too! Basic adult admission to Anne Hathaway’s Cottage is £7.50, but you can also get a combined ticket for all five Shakespeare properties for £19.50 (2011 prices). Booking online here can save you money! Also, tickets are valid for 12 months from the date of issue to allow you to return for free. Anne Hathaway’s Cottage is open every day from 9am to 5pm (April to October) and from 10am to 4pm (November to March). 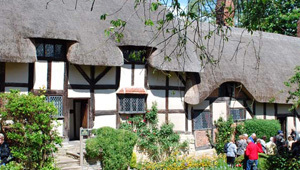 Anne Hathaway’s cottage is located in the picturesque hamlet of Shottery, a short drive from Stratford Upon Avon. If you don’t have a car, you can use the Hop-on, Hop-off Bus Tour to get there. Walking takes around 30 minutes. If you do decide to walk to the cottage, the route is well signed from the town centre.